Phil. If you can conceive it possible for any mixture or combination of qualities, or any sensible object whatever, to exist without the mind, then I will grant it actually to be so. Hyl. If it comes to that the point will soon be decided. What more easy than to conceive a tree or house existing by itself, independent of, and unperceived by, any mind whatsoever? I do at this present time conceive them existing after that manner. Phil. How say you, Hylas, can you see a thing which is at the same time unseen? Hyl. No, that were a contradiction. Phil. Is it not as great a contradiction to talk of conceiving a thing which is unconceived? Phil. The, tree or house therefore which you think of is conceived by you? Hyl. How should it be otherwise? Phil. And what is conceived is surely in the mind? Hyl. Without question, that which is conceived is in the mind. Phil. How then came you to say, you conceived a house or tree existing independent and out of all minds whatsoever? Hyl. That was I own an oversight. That is the Master Argument: you cannot conceive of something in your mind that is unseen. If I try to conceive of the tree outside of my house, I will always conceive of it as being seen from some point-of-view by someone with similar sensory capacities to myself. That is rather straightforward, right? Well, no, not really. Many philosophers have then gone on to say that this means that Berkeley was saying that if I cannot form an image of something in my mind then it does not exist. Now, that is a very problematic statement. Try for a moment to form an image in your mind of the number one, for example. By that I do not mean the numeral ‘1’ — rather I mean the concept behind it. Of course, I can imagine one apple, one car and so on but I cannot imagine the concept of one — or, at least, I cannot visualise it. Does this mean that Berkeley was denying that the number one, or any other number for that matter, exists? No, of course not. I think the reason that this confusion has arisen is because Berkeley in the above passage uses the word ‘object’. That could be taken in the colloquial sense of ‘an object of immediate experience’ or it might be taken in the philosophical sense of ‘an object of thought’. In the case of the latter we might indeed be talking about a concept. But in the sense of the former — which is in keeping with the tone of the Three Dialogues — we are clearly talking about an object of immediate experience. In the Three Dialogues Berkeley was attacking a very particular concept: that of matter. He was giving the example of a tree because this is an object that some claim exists as a substance called ‘matter’. Berkeley would not claim that his argument would apply to the number one or any other concept. What he is getting at in the Three Dialogues is that the concept of matter is a useless abstraction that is often confused for being an object of immediate experience and that we can get by without it. Why is the idea of matter a useless abstraction? Because it passes itself off as an object of immediate experience when it is, in fact, an abstract concept that serves no real purpose. This is what Berkeley is at pains to show. Yes, matter could be said to exist as an abstract concept if we so wished but then the question becomes: why would we use such an abstract concept? It seems obvious to me why we would use the abstract concept of the number one in daily discourse, but it does not seem obvious to me why we should use the abstract concept of, say, a mystical force that heals my body from serious illness without me having to go to the hospital. Both of these have the same philosophical status — that is, they are both concepts that I never experience in an immediate sense — but it is clear that one is useful while the other will likely end up killing me someday. Again, to stress, this is the key point: Berkeley wants to show that matter is a useless abstract concept because it explains nothing that we cannot explain without it. It is a useless abstract concept that passes itself off as something we experience immediately on a daily basis. This is what his writings on immateralism are all about. This is also what Berkeley’s well-known criticisms of abstraction are all about. His famous mathematical work The Analyst, for example, is not concerned with saying that differential calculus is useless. Rather he is raising two points: first of all, that the calculus deals with topics that are far more abstract and mysterious than those dealt with in theology; and secondly, that there is a logical contradiction within the calculus itself. It is the second point that is usually focused on today but it is the first point that was more important to Berkeley because it served as a dual warning: first, that those who dabble in high mathematics and believe that it has bearing on the real world should be very cautious about what they dismiss as nonsense; and second, that people should be very careful when applying highly abstract concepts to the real world as they can easily end up talking nonsense. Religious Mysteries and Points of Faith. S. Matt. c. vii. v. 5. To conclude we should return to the Three Dialogues for a moment. Again, Berkeley was trying to purge philosophical discourse of what he regarded a useless and dishonest abstract concept: matter. In order to do this he had to show that it was an abstract concept with no real world existence that passed itself off as an object of immediate experience. But this is not an argument against abstract concepts as the Master Argument seems to suggest. Rather it is an argument against poor uses of abstraction and useless abstract concepts that cloak themselves as objects of immediate experience. That is what all Berkeley’s work is about and it is as fresh today as it has ever been. Thank you Phil, I hope you write more about Berkeley. Check out the 19th Psalm: speech is the ultimate useless abstraction. Oh there’s lots about Berkeley on here. Check the ‘Philosophy’ tag. Are you saying Berekely is embarking on a project of applying Occam’s razor to those with the concept of “matter” being at the the heart of this project? Yes, that is one way of putting it. In my view, there are some ignored issues here. 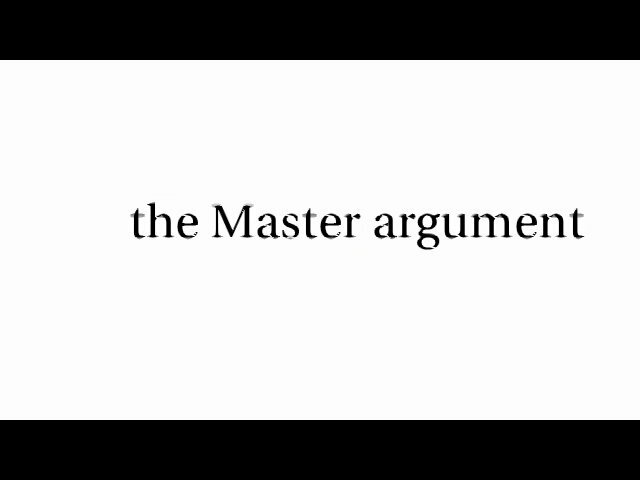 As you correctly state his so-called master argument itself doesn’t deny the existence of the outside world. It merely says that we cannot be conscious of the outside world independent of mind. But this argument is only a part of his whole theory. His subsequent arguments say that there are only spirits (thinking beings) and ideas. He further goes on to say that when we are not conscious of ‘things’, the God is. This is the thrust and the purpose of his theory. This view shows that the external world exists only as an ‘idea’ of a ‘spirit’. In effect, he doesn’t reject our possibility of sensing the outside world, but that outside world is also a product of God’s consciousness. Then God exists.